THE DIFFERENCE BETWEEN A CORRECTIVE ACTION VS PREVENTIVE ACTION IS OFTEN OVERLOOKED BY QUALITY MANAGERS AT MEDICAL DEVICE COMPANIES, ESPECIALLY BECAUSE THE TWO ARE SO FREQUENTLY LUMPED TOGETHER BY ISO AND THE FDA. When you make an acronym out of something, the meanings of the individual words are sometimes overshadowed by the new word that you've created. That's exactly what happened when we turned Corrective and Preventive Action into CAPA - the system of policies and procedures that medical device companies use to address non-conformance issues within their manufacturing processes. CORRECTIVE ACTION VS PREVENTIVE ACTION: WHAT'S THE DIFFERENCE? The main difference between corrective actions and preventive actions lies in whether the nonconformity has taken place. If a nonconformity occurs, it's up to the quality manager to identify and evaluate it to determine whether a corrective action needs to be implemented. 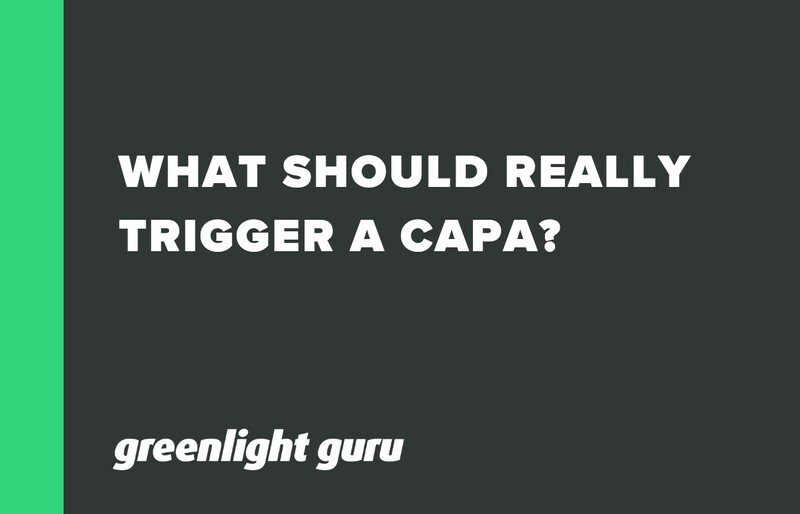 If so, a CAPA incident is triggered and the quality manager should fill out a CAPA form and follow the process. A root cause analysis should be undertaken to determine why the nonconformity happened, and an action plan should be developed to prevent recurrence. Preventive actions are used to prevent nonconformities that might occur in the future but have not happened yet. They are the result of organizations using the information at their disposal to effectively identify potential sources of error before they lead to nonconformance issues. Organizations may perform many types of preventive actions without explicitly noting or even realizing that they are doing so. For example, holding a staff training workshop is a preventive action that is targeted towards reducing errors related to the type of training that is administered. Internal audits are also a preventive action because they can detect issues with equipment, fail-safes, or processes that might lead to a nonconformity issue if left unaddressed. WHAT PREVENTIVE ACTIONS SHOULD YOU TAKE? Corrective and preventive actions together form the CAPA system, one of the core processes of quality management for every medical device company. When nonconformance issues are discovered, there are extensive documentation requirements for nonconformance management that can be facilitated by Greenlight Guru's cloud-based eQMS system. When a nonconformance is escalated to a CAPA investigation, a CAPA form is created and logged into the CAPA portion of the QMS system where it begins the CAPA process. The same process is used to initiate and track preventive actions that are meant to proactively prevent nonconformance issues from occurring. Greenlight Guru's Quality Management Software is a secure and accessible repository for all legally-mandated quality management documentation that your medical device company is responsible for. Keep your records organized can help you save time, reduce costs, and breeze through your next FDA audit, helping you get to market even faster. 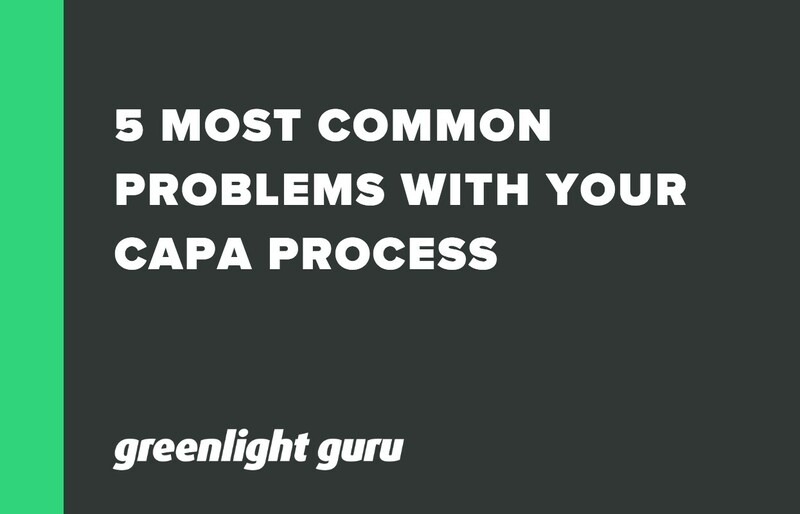 So, you’ve found an issue for CAPA during your internal audit. What’s next? 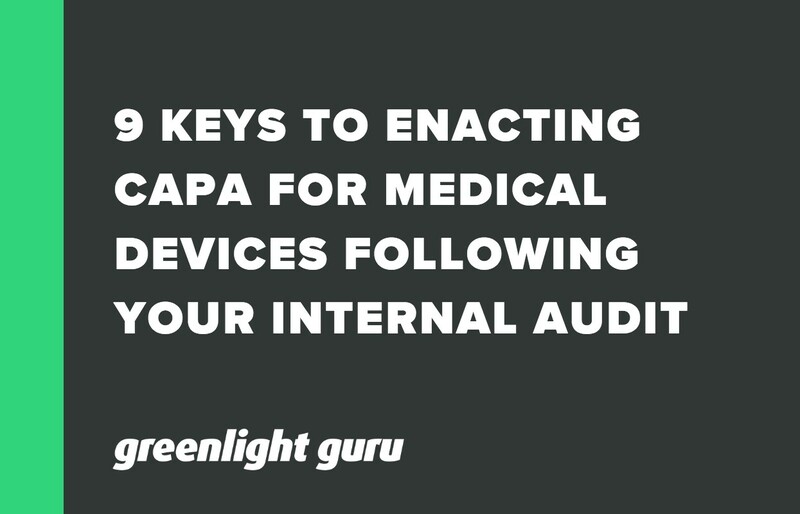 In episode 59 of The Global Medical Device Podcast, Jon Speer & Mike Drues discuss the 5 most common CAPA process problems that they see and how you can avoid them.